Starting from his humble beginnings in Spain to his early international success in Paris, which was subsequently surpassed in America, Jose de Creeft forged his name in stone as a major American artist by the early 1940s. 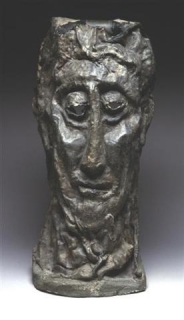 Known as one of the major contributors in developing key techniques in modernist sculpting, de Creeft drew from a wide variety of resources, among them primitivism, tribalism, abstraction, linearism, Folk Art, and his imagination, to create works which duly supported his ingenuity as an artist and capitalized on his versatility in successfully using any medium, style and theme. His sculptures, paintings and drawings all retain a unique sensibility; one which simultaneously references the past and the future. Most importantly, de Creeft’s oeuvre retains all of the nuances and elements of human expression in its most intimate and fleeting moments. He successfully captured the soul of the medium and subject matter, transcending his emotional energy through his carving. In 1915, de Creeft was living in Paris among the modern artists of the first wave of modernism. Pablo Picasso, Juan Gris, Joan Miró and Georges Braque were all instrumental in the European and American modernist movements, and the Parisian ambiance set the stage for invaluable discussions on art, criticism and methodology. Desiring to formulate his own personal aesthetic, de Creeft departed from the traditional techniques and traditions of sculpting, which helped frame the conservative academic institutions worldwide, and instead wholeheartedly applied himself to the process of “taille direct,” direct carving. De Creeft’s earliest introduction to carving was in 1900, at the age of sixteen, where he was apprenticed to a workshop in Barcelona to carve wood reproductions of devotional figures. While the workshop served as an artistically developmental stage for de Creeft, it was an Eskimo exposition in Madrid two years later, which had a profound impact on his developing aesthetic. “The Eskimos impressed me [de Creeft] with their simplicity and their directness of expression. With tiny pieces of ivory they made monumental sculptures that had strength, power and serenity, though they were less than hand-sized” [Mecklenburg, 1983]. For de Creeft, the creative process was his life; if he wasn’t carving a piece of stone or wood, he was creating his own tools, which allowed him to produce more exacting results. His method of carving allowed him to be a part of the entire process of creating a finished piece, one which was not defined as the result of a preconceived determination, but instead as a result of the unbridled spontaneity necessary for artistic fulfillment. Each sculpture embodied his philosophy that the relationship between the artist and his body of work is reciprocal rather than hierarchical. De Creeft responded to each stone, marble block or piece of wood individually, allowing each to evolve from the relationship between the artisan and the innate personality of each material. 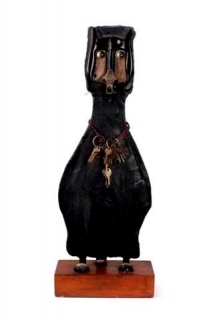 In addition to direct carving, de Creeft received much accolade for his assemblages of found objects, most famously Le Picador. Created in 1925, this sculpture radically departed from his direct carving methodology. It is obvious, from the assemblages created throughout his career, that de Creeft was still wholeheartedly interested in the innate nature of the material. 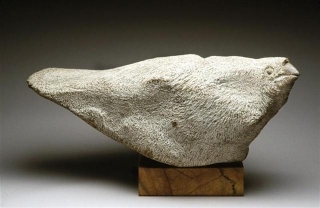 “From my earliest youth I have always found pleasure in giving life to old objects that have lost their usefulness…to deliver them from obscurity [ like a rock] and transform them into objects of art” [Mecklenburg, 1983]. It is with each of these assemblages that one can most intimately be a part of de Creeft’s humorous side. De Creeft thoroughly enjoyed the craft of painting, and drawing specifically, because it allowed him the most rapid documentation of his thoughts. It provided a means of expressing that which was too laborious to carve. 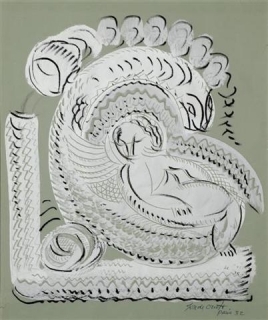 These two-dimensional mediums and techniques allowed him to create an imaginary world, filled with animals, characters and landscapes, all which attested to his unwavering interest in “expressing his beliefs and feelings about life and to elevate mankind by demonstrating man’s creative aspirations” (De Creeft, 1945). De Creeft’s early training as a draftsman began in Madrid and continued in Paris, at the Academie Julien, where he learned the techniques of perspective and precision, but similar to his path chosen in sculpting, he soon set into a world of his own, creating biomorphic creatures in imaginative environments. These creatures reflect much of de Creeft’s primitive and African influences and successfully capitalize on the transcendence of ideas pertaining to evolution, even more easily realized in his drawings than his sculptures. The definition of characteristics associated with both land and sea animals are evident, while the final compositions incorporate a mélange of these associative references in an entangled and rather disassociated manner. De Creeft used his drawings not as a technical tool or academic exercise, but instead as an expression. His early drawings of the 1900s have a futuristic aesthetic, with their bold lines, hard contours and un-shaded areas. However his drawings from the 1920s represent a more romantic approach, filled with voluptuousness, sensuality and maternalness. De Creeft’s paintings followed a much more abstract path than his drawing and sculpture. His paintings ranged from various themes of self-portraiture, abstraction, figuration, and landscape and similar to his carving, he used a variety of different mediums. De Creeft was not only admired by his peers, but also by the public. Within his lifetime, he was awarded several important, public commissions, including two hundred stone sculptures for the Fortaleza in Mallorca (1927-29), the Alice and Wonderland bronze group in New York City (1957-59), and the Nurses mosaic mural, at the Bronx Municipal Hospital (1961-62). 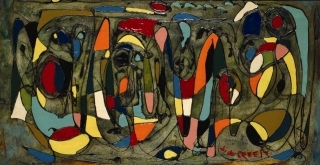 His work was included in numerous solo exhibitions around the world including a major retrospective at the Fundació Joan Miró in Barcelona in 1980, which circulated throughout seven different cities in Spain, a retrospective at the Whitney Museum of American Art, and a major exhibition at the National Gallery of Art. In addition, de Creeft has a long group exhibition history at landmark institutions such as the Art Institute of Chicago, the Brooklyn Museum, the Metropolitan Museum of Art and the Museum of Modern Art.